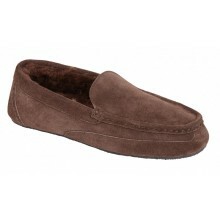 Shoes International have a wide variety of mens moccasin slippers from popular brands including Martino, Ecco, Amimoc and Draper of Glastonbury. Our range of mens moccasins are the most popular of all our slippers and come with our famous price pledge which guarantees to beat any of our competitors prices by 5%. All orders also come with free UK delivery.